Welcome to Earth n Dogs! Earth n Dogs is the creation of artist Jean Barrett. You will find many different Herding Breeds depicted in their natural state - WORKING LIVESTOCK! We are just beginning, so stop back often to see the new pieces as they become available to the public! 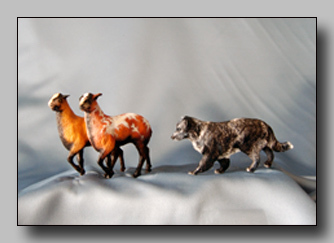 Jean's own love of her Australian Shepherds, combined with her artistic ability to reproduce them in clay, led her to offer these original, one of a kind pieces to the public. Jean has devoted many years to competing and trialing her dogs in vairous stockdog competitions. The many years of trialing has given her an abundant source of reference material for her sculptures. She is familiar with what was needed to depict good working dogs. 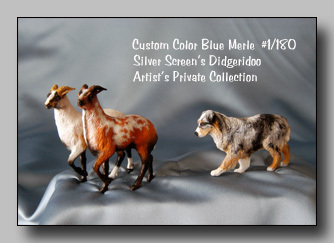 Browse through and find your favorite herding dog! As the months go by,check back often to look for more of your favorite herding breeds, plus various other livestock and other poses! These pieces make wonderful gifts, trophy awards, and are a great addition to any collection. They are made from the finest earthenware and are then cold painted for life-like detail!